The Lung Cancer Mortality Reduction Act of 2009 does not address lung cancer prevention. The bill states that 60% of new lung cancers are in non-smokers, but it makes no mention of radon gas, the leading cause of lung cancer in non-smokers. The bill makes no provision for education about radon or testing of homes to detect elevated radon. There is no assistance for homeowners needing mitigation. There is no incentive for builders to use Radon Resistant New Construction. Proposed by Senator Diane Feinstein (D-CA), the bill calls for $75 million in funding for drug research. I met with Senator Feinstein’s Legislative Assistant, Kristen Wikelius, to ask that 10% of the funds go toward lung cancer prevention. I reminded Ms. Wikelius that lung cancer treatment is rarely effective. Lung cancer is nearly always fatal within five years. I explained the cost-benefit of preventing lung cancer, rather than grasping for treatments that might someday become more effective. A homeowner can test for radon using readily available test kits. The California Department of Public Health sells test kits to residents for $5. Certified labs sell test kits for around $25. A short-term screening test takes just 2-4 days. A more reliable long-term test takes 3 months to a year. I pointed out to Ms. Wikelius that homes with elevated radon can be fixed for a few thousand dollars. The most cost-effective way to reduce radon in a new home is Radon Resistant New Construction (RRNC). For about $500, RRNC can reduce the radon in a home by about half. If needed, further mitigation of RRNC homes is easy and much less expensive than installing a mitigation system after the home is built. In contrast, first year treatment of lung cancer victims costs about $125,000. Those treatments are debilitating and rarely successful. I asked that Senator Feinstein amend her bill to address prevention of lung cancer. Senator Feinstein’s aid was not willing to discuss lung cancer prevention. She said the bill will not include radon testing or education about radon. The word radon will not appear in the Lung Cancer Mortality Reduction Act. The one meager concession was to include EPA’s Radon Division in discussions concerning lung cancer. Not much searching was needed to find the source of Senator Feinstein’s position on lung cancer. Pfizer, the largest pharmaceutical company in the country, invested $522 million in their La Jolla Laboratories near San Diego, CA. Sutent®, developed by Pfizer at La Jolla, is now in clinical trials for lung cancer treatment. Pfizer made $1.6 million in political contributions in 2008. Amgen, the world’s largest biotech company, is based in Thousand Oaks, CA. Amgen has focused much of its research on treatments for cancer. Motesanib, developed by Amgen, is now in clinical trials for lung cancer treatment. Amgen made $1.3 million in political contributions in 2008. Since 1989, Senator Feinstein has received over $1.4 million dollars in contributions from the Health Sector, according to OpenSecrets.org. Has Senator Feinstein allowed pharma companies in her constituency to guide her position on lung cancer? Is the Senator’s lack of interest in lung cancer prevention is due financial support from companies that provide drugs for treatment? Constituents wishing to ask Senator Feinstein those questions can contact her here: email for Senator Diane Feinstein. 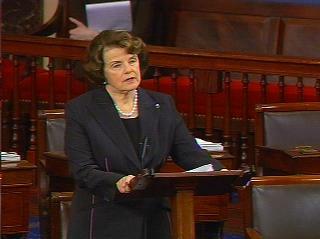 Photo from Senator Feinstein’s photo gallery.